The AJC Peachtree Road Race might not be the first event that comes to mind when one thinks “costumes.” In California, the Alaska Airlines Bay to Breakers 12K is well-known for its outlandish getups. RunDisney inspires participants of all ages to dress as their favorite Disney characters. But as the years have gone by, costumes have slowly become a big part of the Peachtree experience. Uncle Sam, Wonder Woman and Superman are all well-represented. For the most part, the most creative costumes can be found at the back of the pack, which becomes a grand parade. But that doesn’t mean folks at the front are left out. As the open race gets under way, the starting line is largely occupied by slight men with deadly focus. For a Ryan Hall or a Daniel Salel, the start of the race is a serious affair, with the pack of elite men jostling for position in the opening 400 meters. But close by is a very different-looking crew of runners, taking a decidedly less serious approach. Masterminded by twin brothers Kevin and Shaun Matthews, they burst out to the front of the race and hold on for dear life as long as they can. With the race broadcast nationally on NBC and locally on WXIA 11Alive, this costumed crew has gotten its fair share of camera time in the past decade and become part of the Peachtree experience. In the first 35 years of the race costumes were discouraged, largely because of the heat. Perhaps inspired by the success of and stories from the Bay to Breakers 12K in San Francisco, the number of participants dressing up for Atlanta’s iconic race only continues to grow. Making a more-intricate costume than the year before has become part of the tradition, and an entire cottage industry has formed around capturing the costumes – by the afternoon of July 4, you’re likely to see multiple slideshows already posted online by media outlets highlighting the best costumes of the year. However, that doesn’t mean that anything goes. Atlanta Track Club prohibits outfits that are not form-fitting or that cover participants’ faces, as part of the Club’s security and safety measures. As for those twins, it all started in 2008 as a successful dare to get one of their friends to jump out to the lead in a Speedo. “Every year since then, we’ve always just dressed up in costumes and tried to take the Peachtree lead out,” said Shaun. When the tradition started, the brothers were near the peak of their running careers and able to hold on to the pace much longer than your average stunt-runner – both ran competitively in college, Kevin for Georgia State and Shaun for the University of West Georgia. In 2011, in a moment that would have gone viral had internet virality been a thing yet, viewers tuning in to see the USATF Men’s 10km Championships hosted by the Peachtree that year found themselves watching three men painted like American eagles in the lead pack for the first 1200 meters of the race. Over the years, that dwindled to 800 meters, and as they’ve gotten older and fallen further away from their college running shape, leading the race has become less and less a point of emphasis. Instead, it’s now about having a memorable time with their 15 or so friends, whether they are all dressed like astronauts, Founding Fathers, peach trees – Kevin calls this the worst of their costumes – or matadors. Last year, however, the gang went over the line and found themselves in breach of Atlanta Track Club’s clothing policies. With 17 people wearing cardboard boxes that connected and formed a MARTA train, the group was disqualified. 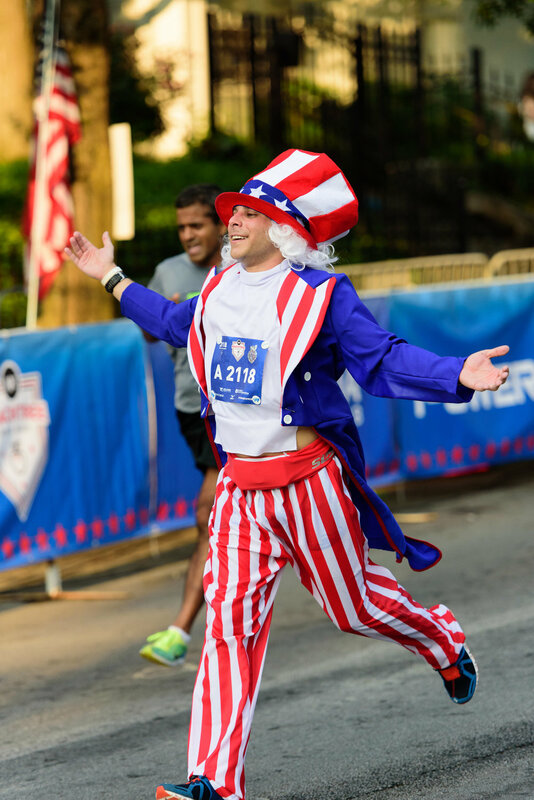 The Matthews brothers will return to the drawing board this year in search of a policy-abiding costume, with the hype already starting to build around what they’ll be wearing for the 50th Running of the Peachtree. “Everyone’s parents and everyone’s significant others are always asking what we’re doing and we honestly don’t know because we’re running out of ideas,” said Kevin. If you’re looking for costume inspiration, check out some of the highlights from over the years below. How strong are the event records of the AJC Peachtree Road Race? Strong enough that the open women’s record has stood for 16 years, and the men’s for 22. When members cross the Peachtree finish line, the party doesn’t stop there.